N e w s / V i e w s M T D F e b r u a r y 2 0 1 9 12 N e w s / V i e w s N ew store sales accounted for 6.4% of Monro Inc.'s net sales in its third quarter ended Dec. 29, 2018. at boost helped the company register an 8.5% increase in total sales versus the same period last year. (Monro's fiscal year runs from April 1 to March 31.) Monro recorded net income of $20.5 million on net sales of $310.1 million for 3Q 2019. at compares to income of $11.6 million on sales of $285.7 million in fiscal 2018. e company's income-to-sales ratio was 6.6%. Monro also recorded a 4.8% increase in operating income, which rose from $29.3 million to $30.7 million. The company plans to enter a new st ate in t he four t h qu ar ter of f is - cal 2019 with a 12-store acquisition in L ouisi ana. Thes e lo c at ions are expected to add approximately $15 million in annualized sales, repre - senting a sales mix of 35% ser vice and 65% tires. 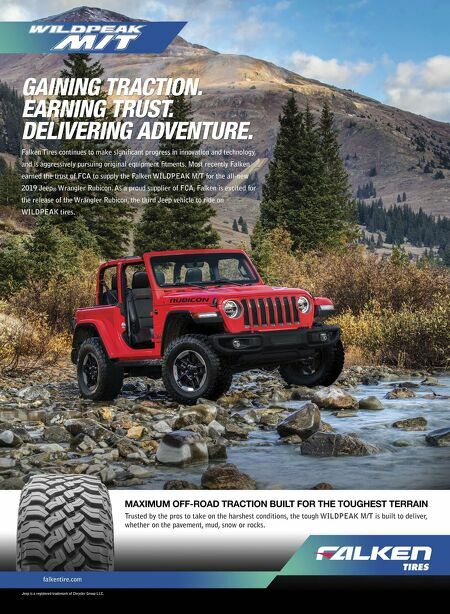 Acquisitions boost Monro's 3Q results Big O Tires moves into Texas T BC Corp. has sold eight of its NTB Tire & Service Center stores in Texas to a Big O Tires franchisee, allowing the Big O Tires brand to enter the Lone Star State. Franchisee Chris Monteverde will convert the stores to the Big O Tires format in the next few months. Monteverde also owns 19 Big O Tires stores in California. "Chris is an exceptional operator; he and his team live the values of the Big O Tires brand each and every day, and we're fortunate to have them representing the team," says John Kairys, vice president and general manager of Big O Tires. With the nine added stores, Big O Tires has more than 455 independently owned and operated loca- tions in 25 states. "As an organi- zation with more than 3,200 retail l o c at i ons , b ot h company-owned and franchise, it's imperative that we consider our entire p or t fol i o w h e n evaluating oppor- tunities," says Erik Olsen, CEO and president of TBC. "We will now have the opportunity to serve consumers in the state of Texas through three retail great brands — Big O Tires, Midas and NTB — at nearly 170 locations." Monteverde says: "e opportunity to expand our portfolio within the Big O brand and have a chance to do business in the great state of Texas was one that we didn't think twice about. We're excited about the future and eager to continue exceeding customer expectations in California as we make a name for ourselves in Texas." is isn't the first time TBC turned some of its company-owned retail stores over to a franchisee. At the end of 2017, TBC expanded the Big O Tires brand when it franchised more than 40 company-owned NTB locations in Minnesota, Iowa, Kansas and Missouri to Western Automotive Ventures Inc. at franchisee also had an existing relationship with TBC and Big O Tires. A Western Automotive Ventures affiliate, Western Automotive Group LLC, also owns and operates 11 Big O Tires locations in Nevada. 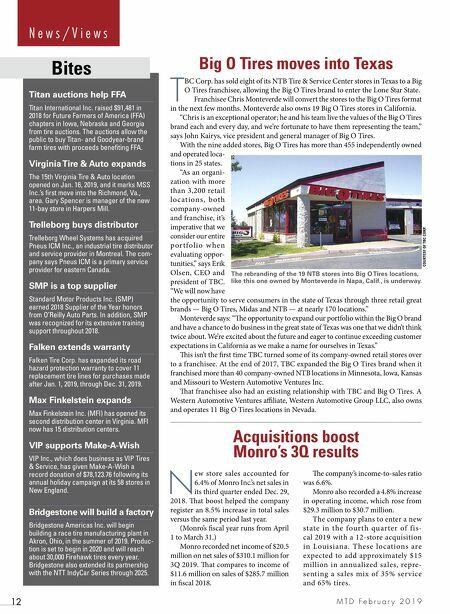 The rebranding of the 19 NTB stores into Big O Tires locations, like this one owned by Monteverde in Napa, Calif., is underway. Titan auctions help FFA Titan International Inc. raised $91,481 in 2018 for Future Farmers of America (FFA) chapters in Iowa, Nebraska and Georgia from tire auctions. The auctions allow the public to buy Titan- and Goodyear-brand farm tires with proceeds benefiting FFA. Virginia Tire & Auto expands The 15th Virginia Tire & Auto location opened on Jan. 16, 2019, and it marks MSS Inc.'s first move into the Richmond, Va., area. Gary Spencer is manager of the new 11-bay store in Harpers Mill. Trelleborg buys distributor Trelleborg Wheel Systems has acquired Pneus ICM Inc., an industrial tire distributor and service provider in Montreal. The com- pany says Pneus ICM is a primary service provider for eastern Canada. SMP is a top supplier Standard Motor Products Inc. (SMP) earned 2018 Supplier of the Year honors from O'Reilly Auto Parts. In addition, SMP was recognized for its extensive training support throughout 2018. Falken extends warranty Falken Tire Corp. has expanded its road hazard protection warranty to cover 11 replacement tire lines for purchases made after Jan. 1, 2019, through Dec. 31, 2019. Max Finkelstein expands Max Finkelstein Inc. (MFI) has opened its second distribution center in Virginia. MFI now has 15 distribution centers. VIP supports Make-A-Wish VIP Inc., which does business as VIP Tires & Service, has given Make-A-Wish a record donation of $78,123.76 following its annual holiday campaign at its 58 stores in New England. Bridgestone will build a factory Bridgestone Americas Inc. will begin building a race tire manufacturing plant in Akron, Ohio, in the summer of 2019. Produc- tion is set to begin in 2020 and will reach about 30,000 Firehawk tires every year. Bridgestone also extended its partnership with the NTT IndyCar Series through 2025. Bites COURTESY OF TBC CORP.